I literally get a little bit of anxiety when I unroll a jelly roll. I’ve tried to roll them back up and make them as pretty as they came…not possible! Don’t even get me started on opening a Fat Quarter Bundle! …but all together I kind-a love it! I’m going add a colorful binding to liven things up a bit….and I love that I can leave this “Halloween” quilt out all year long! 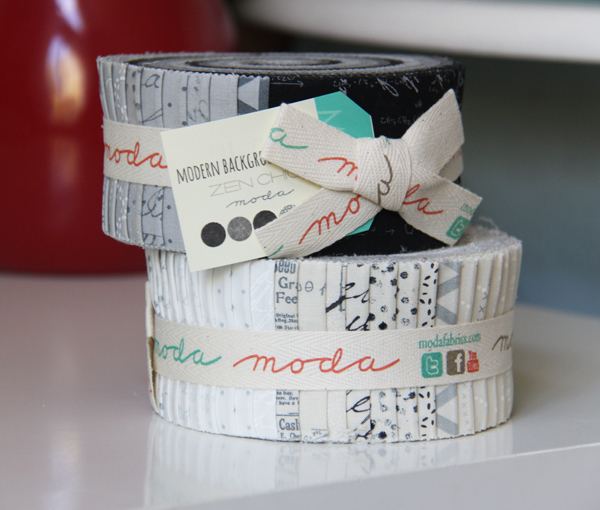 The fabrics are from Zen Chic for Moda. The light (Paper) fabrics are available now at quilt shops (or here online), and it looks like the dark fabrics in this collection (Ink) will be out this week (also found here). I don’t just kinda love it, I totally love it!! Love it! Such a cool quilt. This is awesome. Can’t wait to see more. 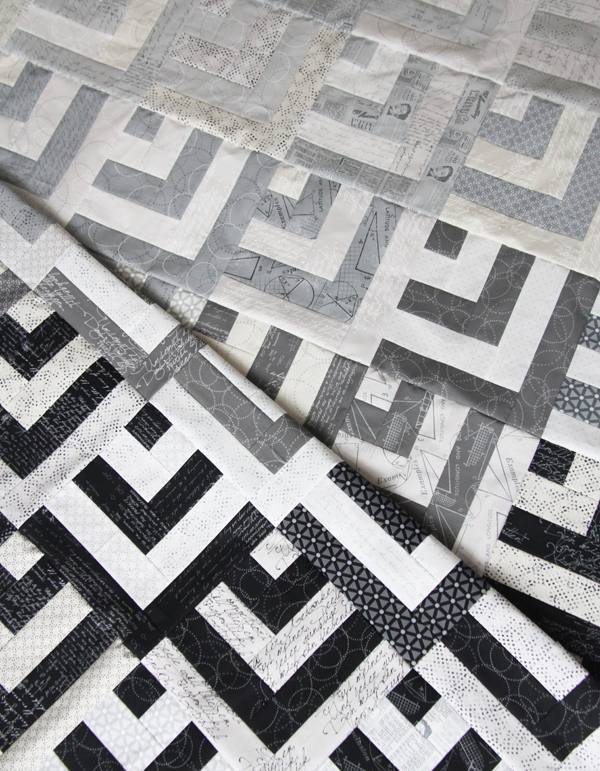 I am not a modern quilter, but I find the combination of this pattern and these blocks stunning. Thank you Cindy, what a great compliment!!! Oh, I LOVE this!! I’m usually all about the color… but this is just gorgeous. Will you be sharing a pattern, or at least what you cut your strips? Would love that! You bet Melissa! It’s pretty easy and all the strips are 2 1/2″ wide to begin with. The corner square is 2 1/2″ square, the second “layer” pieces are 2 1/2″ square, and a 4 1/2″ strip, the second layer pieces are a 4 1/2″ layer strip, and a 6 1/2″ layer strip, the 3rd layer is a 6 1/2″ strip and a 8 1/2″ strip, and the fourth layer is a 8 1/2″ strip and a 10 1/2″ layer strip. You make an even number of blocks alternating the light/dark strips, and that’s it! I had to draw it out/color it on graph paper so I could remember how many strips to cut but it’s not too bad! Thank you so much! I love how this looks–just beautiful! Love this quilt!! and….. love the Mini Quilts Patterns I recently purchased from you! You are so generous ~ the designs & instructions for 8 beautiful little mini quilts all in one booklet format is wonderful!! I’m so glad you like it Penny! The patterns stuffed into one booklet was kind of an experiment…but I think it works well!!! 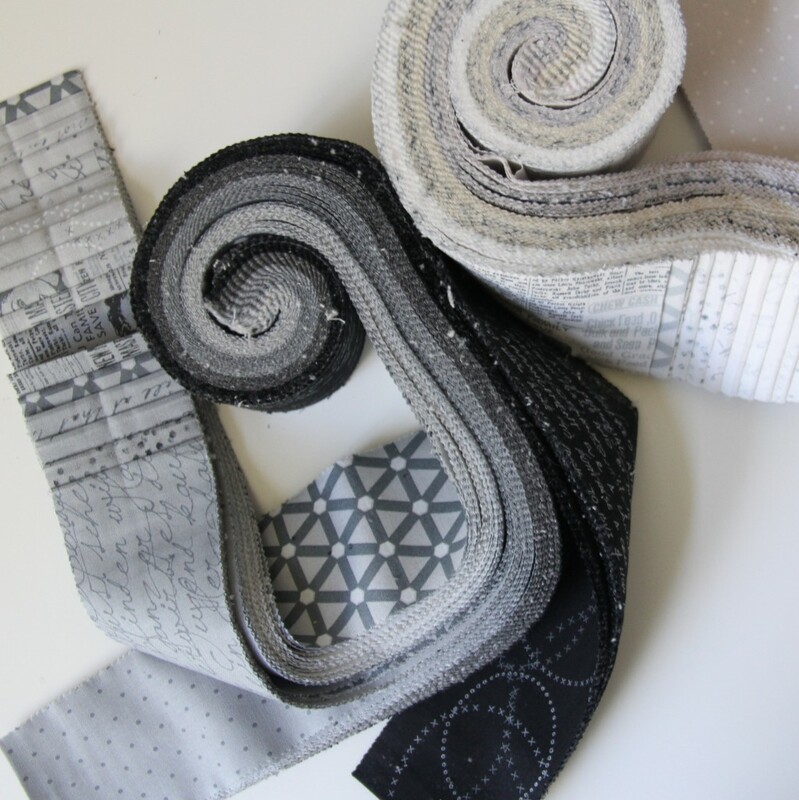 Wow wow I have been looking for gray fabrics to make an elephant quilt (patchwork 2.5 inch squares) so it looks like this jelly roll would be perfect but leave lots of left overs but less then buying yardage to get many different grays ….. but hmm did you end up with left over grays or use them all up? If I bought these jelly rolls and “copied” your quilt are there left overs ? This quilt used almost all of my Jelly Rolls, but I also wasn’t super “careful” with my cutting. There is probably at least 10″ or so scraps of some of the strips, and 5″ or so of all of the strips. I totally love what you’ve done! Is it all one quilt? Will you please show off the big picture/finished project if/when something like that is ready to be shown off? Love the look you achieved with the variety of grays! Love your ‘un-halloweeny’ quilt! It’s good that you can leave it all year long because it’s way to beautiful to hide it 3/4 of the year! The blocks look lovely. I would put a black binding around it. I think that that will enhance the grey. 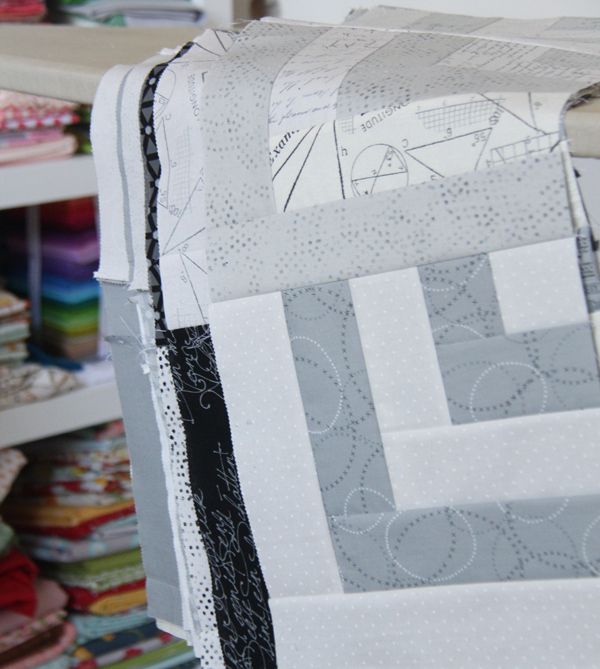 ohhhh I love it Allison….great jelly roll, and yiu picked the perfect pattern for it! Your choice of the quilt pattern to this fabric is perfect. I rarely make modern looking quilts, but some family members on my gift list would love this pattern idea. Thank you! Thanks for giving the cutting directions In your comment to Melissa. I figured this was how the pieces were cut, but it’s great to have confirmation. Looks like there are a lot of us who are in love with this quilt. What a great jelly roll pattern. I have a Bali Pops roll that I bought “on spec” a few years ago and have never until now seen a pattern that really spoke to me. Thanks for the idea and instructions. Love this, can’t wait to see the entire quilt. This is the quilt I plan on making for our king-size bed. I plan on putting pops of yellow, but use more gray than black. I wanted to see it done before I started such a monumental task and now I know I’ll like it. Thank you for sharing. OHH. I have a half roll and now I can’t even remember what I was planning to do with it. It clearly needs to be combined with some white strips and pieced like this. Gorgeous! I’m in awe of those that can design patterns like this! Will this be a paper/download pattern? I sell your patterns in my shop & would love to add this one! Hi Robin! I’m going to do a quick tutorial for this one because I’ve had so many people ask for it and want it NOW! But maybe in the future. :) Thank you for carrying my patterns! It looks great. I need a whole lot of greys for a guild challenge and I think these just might be the ticket. Allison it’s fantastic. Cute and sophisticated at the same time! Love this quilt, I would like to know if you find the material will shrink, always seem to be advised to wash before sewing with fat quarters. Do jelly rolls Shrink? Hi Sandra! Nope you don’t need to wash your jelly rolls…and if you do you’ll have a tangled mess in the washer/dryer! I don’t prewash any of my fabrics unless they are red, or black solids…and even then it depends on if it’s good quilt shop quality or not. I’ve found my cottons shrink very little, mostly it’s the batting in a quilt that will shrink up anyways. Thanks! I found your quilt this morning, been looking for a pattern in grays blacks and whites as I have about 50strips left over from a bargello and found yours, started straight away cutting them up. Noticed a few comments on adding a colour,I am thinking about it, about how many places would you put one.